Benoît B. Mandelbrot (20 November 1924 – 14 October 2010) was a Polish-French-American mathematician. Mandelbrot was born in Warsaw into a Jewish-Lithuanian family. He is best known for his works with fractal geometry. He lived and worked until his death in the United States. He was a professor at the University of Yale. Mandelbrot was born in Warsaw, Poland and died of pancreatic cancer at the age of 85 in Cambridge, Massachusetts. His most known development is the Mandelbrot set, which he discovered and described in 1979. 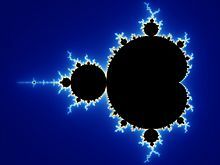 A picture of the Mandelbrot set. ↑ 1.0 1.1 "Benoit Mandelbrot, Mathematician, Dies at 85 - Obituary - NYTimes.com". nytimes.com. Retrieved 16 October 2010. ↑ "Benoit Mandelbrot". nndb.com. Retrieved 16 October 2010. This page was last changed on 30 August 2017, at 21:48.